In Cari’s case, she took a courageous journey beyond her roles as dedicated housewife and mother (roles she never gave up, by the way) to become an adventuresome travel guide who led others to explore their dreams and stretch themselves to their physical and emotional limits. Whatever your dreams, I believe you will find Cari’s new book, Life on the Loose, to be inspiring and perhaps just the kick-start you need to reach beyond your current roles in life. She convinces the reader that if she can do it, you can do it too. Cari’s book also provides captivating summer reading. Once I started her book, I couldn’t put it down. For 32 years, through her travel adventure company, Venture West, Cari led wilderness tours all over the country and even to Nepal several times. With canoes, kayaks, tents and backpacks, she and those she led explored such awe-inspiring areas as Zion National Park in southwest Utah, Pictured Rock National Park in Michigan’s Upper Peninsula, the Green River in southern Utah, Alaska Basin in the Tetons, Gila Wilderness in New Mexico, St. John Island in the Virgin Islands, the Needles section of Canyonlands National Park in southeastern Utah, Smoky Mountains National Park, Spanish Peaks wilderness area in Montana, Olympic National Park on Washington’s Olympic Peninsula, Grand Canyon National Park and many more wonderful wilderness areas. Amid all her stories, we learn that Cari is facing personal challenges of her own, including raising four children as she goes through a painful divorce. We learn how her adventures on the trails gave her the inner peace and self-assurance to move forward with joy and belief in herself. (She calls the wilderness “my safe place.”) Her tour participants undoubtedly embraced Cari’s “can do” approach to adventure too. That’s why so many of them kept coming back to join her tours over the years. I think readers of this book will also be inspired to step out of the box to face new challenges and embrace new opportunities. I know that’s the way I felt after finishing Life on the Loose. This was one of those rare books I was sorry to finish. And if you are just looking for a good book for the beach, this is it. 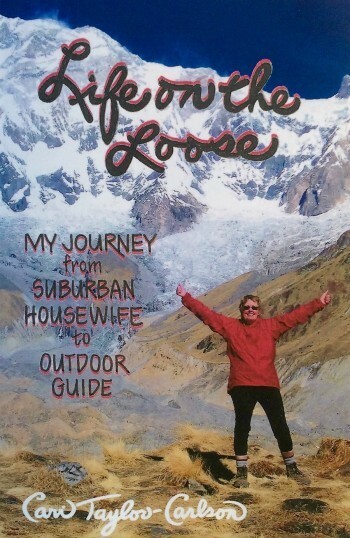 Life on the Loose is available for $16.95 through Henschel Haus Publishing or via Amazon. And the good news is that the book is now available for Kindle.